Can someone link me a previous thread or tell me where I can get parts for MoparMan's hybrid turbo or where I can just buy the whole unit? Looking for a good upgrade. Performance upgrades I have are a BHAF, Smarty S03 (again, SORRY ), DAP 7x.009 100hp VCO injectors. 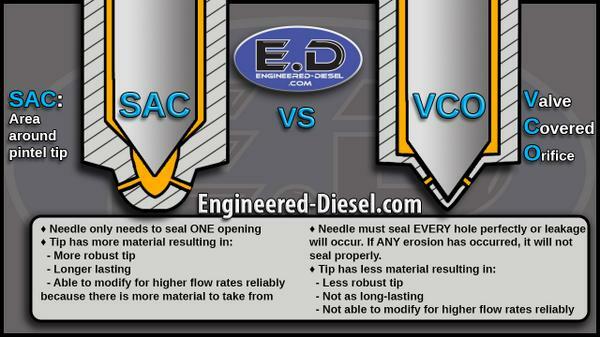 Also whats the difference between VCO and SAC? All I was told is to buy VCO for the best mileage between the two and I never really learned or understood the difference. Anything helps as always. Thanks! Yeah, I had to do it. The only reason I did the HX35/40 is because I wanted to keep my exhaust brake. If I didn't have the exhaust brake I would of jumped for a 62/68/12 most likely. So would it be a good idea to do the hybrid with the 62/68/12 with my setup? I was thinking about going with a Borg Warner but they're expensive lol. I'm also worried now if I picked the right Injector tip for mileage. Between the pintle needle and the nozzle. VCO is what your stock injectors. I'm also running VCO 7 x 0.0085 DAP injectors. So would it be a good idea to do the hybrid with the 62/68/12 with my setup? Stock HX35W is 54/60/12, Hybrid 35/40 is going to be only 60/60/12. Since you don't have an exhaust brake you can go anywhere. I've got to stay with the hybrid just so I'm not buying another $1,200 exhaust brake. Yeah I'll definitely watch that. That's man!